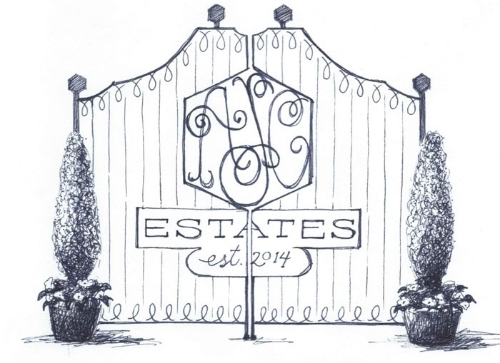 Welcome to the 2014 Home & Garden tour of AJC Estates! All of the above are 11x14" ink drawings. More than half of these were commissioned by BWS Landscaping in Richmond, Virginia. The company gave them as gifts to some of their residential clients. I can tell you, hands-down, that if I lived in the Richmond area, I'd call Brad ASAP to hire BWS as my landscaping company. How many landscapers do you know that give Christmas gifts - especially one-of-a-kind, custom, original artwork? For BWS' clients, I got to work with some fun gift wrap! Not sure if you can see the glossy crocodile pattern on the paper, but it's pretty awesome. With that, I must conclude blogging for 2014. Can't wait to show you some more things I've been hiding for a while, and continue to post new works in progress! There's some fun ones coming down the line! Wishing a very Happy New Year to you and yours. Y'all come back now, y'hear?